We offer a comprehensive range of monoclonal and polyclonal antibodies against infectious agents. These antibodies are directed against specific human viral proteins and are highly specific in immunoassays. 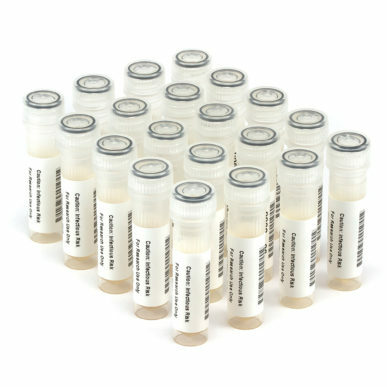 Our range of MONOBODIES™ can be used in different applications including ELISA, immunoblotting and immunochemistry. Antibodies are proteins found in the serum, known also as Immunoglobins (IgG). These are serum proteins which belong to a group of proteins called gamma globulins. These proteins are created by the body as a response to antigens, which are substances produced by foreign bodies whether they be carbohydrates, proteins, nucleic acids or lipids. Antigens are harmful germs or pathogens, or other foreign substances which threaten and can alter the normal functioning of the body. MONOCLONAL ANTIBODIES (MABs) are monospecific antibodies that are made by identical immune cells, all clones of a unique parent cell. These antibodies are produced by the body naturally as part of the immune system’s response to germs, vaccines and other foreign bodies. MABs offer advantages over polyclonal antibodies due to their homogeneity and binding specificity. As they detect one target epitope, MABs are less likely to cross-react with other proteins than polyclonal antibodies, which can recognize multiple epitopes on any one antigen.